Southern’s Saelym Larsen (17) attempts a spike, during the Lady Tornadoes’ TVC Hocking match against Eastern on Aug. 29 in Tuppers Plains, Ohio. WILLOW WOOD, Ohio — The road trip was long enough, the Lady Tornadoes didn’t want to waste any time once they were there. 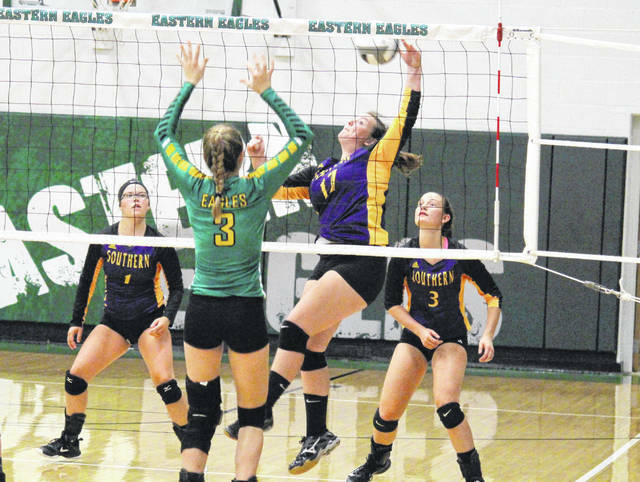 The ninth-seeded Southern volleyball team claimed a straight games sweep of eighth-seeded host Symmes Valley, in Monday’s Division IV sectional semifinal in Lawrence County. Southern (6-15) — which also ousted the Lady Vikings from the 2016 sectional tournament — took the opening lead in the first game, but fell behind 6-2. Symmes Valley (7-14) extended its lead to five points, at 17-12, but the Lady Tornadoes claimed the next 13 points and the first game by a 25-17 count. The Lady Vikings took a 10-6 lead to open the second set, but Southern scored five in a row and led for the first time at 11-10. The hosts tied the game at 11 and 13, but never regained the edge, eventually falling by a 25-22 tally. SHS scored the first four points of the third game, but the Red and Silver took the lead at 6-5. Southern was back in front at 8-7 and never trailed again on its way to the match-sealing 25-16 victory. For the match, Southern had a 54.4 side-out percentage, while Symmes Valley earned a 40.3 side-out percentage. The Lady Tornadoes had an 89.2 serve percentage with eight aces, while the Lady Vikings had an 85.5 serve percentage with nine aces. The Purple and Gold picked up 21 kills for an 11.6 hitting percentage, while the hosts had 14 kills, but a hitting percentage of zero. SHS junior Baylee Wolfe led the victors with 18 service points, including five aces. Sydney Adams was next with 12 points and one ace, followed by Phoenix Cleland with five markers. Baylee Grueser and Peyton Anderson had four points apiece, with an ace by Grueser, while Marissa Brooker finished with two points and one ace in the win. Brooker led Southern at the net with six kills and a block, followed by Cleland with four kills. Wolfe posted three kills and a match-best five blocks, Jordan Hardwick added three kills of her own, while Mickenzie Ferrell had one kill and one block. Adams, Kassie Barton, Abby Cummins and Saelym Larsen each had one kill for the Purple and Gold. Symmes Valley was led by Alison Klaiber and Morgan Jenkins with eight points apiece, including three and two aces respectively. Ericca Ross had six points and two aces, Ellie Johnson added three points and an ace, while Emily McCleese earned one point on an ace. Klaiber led SVHS at the net with four kills, followed by Kylee Jenkins and Payton Hunter with three apiece. Kylie Deer had two kills in the setback, while Ross and Jenkins had one each. Third-year SHS head coach Kim Hupp is hoping that the Lady Tornadoes can carry the momentum into Thursday’s sectional final at Waterford. The Lady Wildcats are the top-seed and claimed a pair of victories over the Purple and Gold in the regular season.